Maddhur vade is a south Indian recipe. It is a wonderful snack for the tea time. You can also serve it for kids parties and kitty parties. It keeps well for 3-4 days without refrigeration. So you can make it in advance for a party. It comes from the Maddhur town, near Bangalore in Karnataka. It is easy to make. There are a few variations of maddur vade. This is one easy and simple recipe. How to make maddhur vade? plastic sheets or an empty bread packet cut in 2. Roast rava without oil for 5-7 minutes till raw smell goes. Cool completely to room temperature. Chop onions and green chillies finely. In a bowl mix all the ingredients except oil for frying. Add enough water to the mix and make a soft dough (like chappati dough). Keep aside for 10 minutes. Heat oil for frying on medium flame. Lightly grease the plastic sheets. Wet your fingers. Pinch a ball of lemon size from the dough and shape it like a thick puri (1/4 inch). Make a hole in the center for even cooking. Fry the vadas in hot oil till golden brown or till bubble reduces. Remove, drain and serve hot or at room temperature. 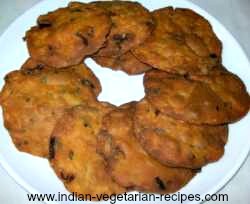 This vada goes well with any chutney or tomato sauce or ketchup, or as it is. Vegetables like grated carrots, cauliflower or cabbage can also be added to make it more nutritious. It tastes like medu vada, no grinding reqired, absorbs less oil and can be kept for 2-3 days. Join in and write your own page! It's easy to do. How? Simply click here to return to Vegetarian snack Recipes. Vangi bhaat karnataka rice recipe is a spicy rice recipe from South India. It is a one dish meal. Also make it for parties, get together etc. I promise to use it only to send you Easy Veg-Cooking Guide. from different regions in India. Copyright© 2007- www.vegetarian-cooking-recipes-tips.com - All Rights Reserved. - Unauthorized use prohibited.